Apple stores aren't just places to buy iPhones -- they're at the crux of Apple's brand and its ongoing push into services. With Apple's head of retail departing soon, what's next for its powerful retail division? Apple stores are more than just places to shop. That was highlighted by the recent news that Angela Ahrendts, Apple's (AAPL - Get Report) retail guru since May 2014, is leaving the company in April for "new personal and professional pursuits," according to a press release this week. Under Ahrendts' watch, Apple saw both an expansion and an evolution of its retail division, which now encompasses 506 physical stores across 22 countries, as well as 70,000 employees. 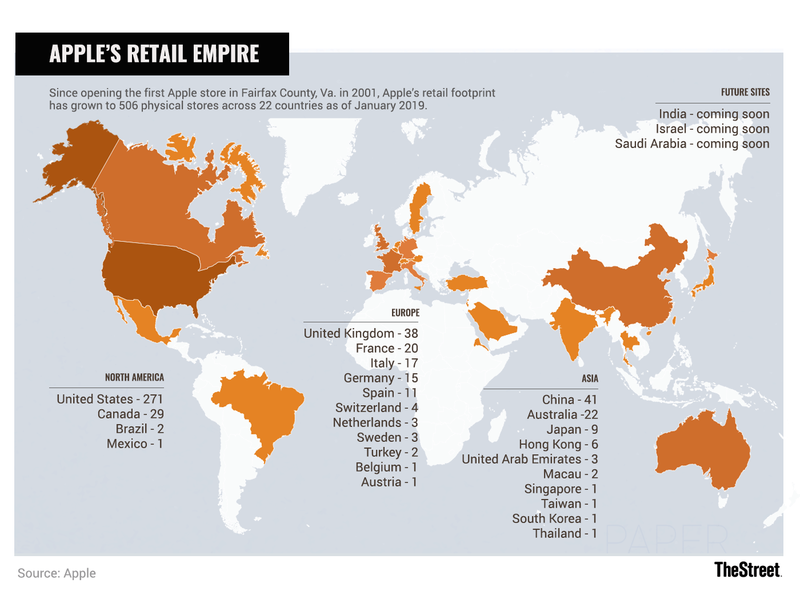 When Ahrendts started, Apple had 424 stores and just 13 in China, with the latter number now more than tripling to 41. But perhaps more importantly, Apple has established itself at the forefront of broader trends in retail, according to eMarketer analyst Andrew Lipsman. "They revolutionized and popularized experiential retail -- the transformation that we're in from inventory-led retail to experience-led retail," Lipsman explained. "The leading retailers today understand they need to lead with experience, and that's what it's going to take to get consumers back to the store, particularly the millennial set that's used to buying things online." In Apple's case, that idea, driven by Ahrendts, has manifested in a number of ways. Apple stores nowadays serve as much more than a place to pick up your next iPhone or MacBook. Many offer a host of complementary services, Lipsman added, which can include not just customer service but free classes in photography, video, coding and other skills. Some of the larger stores (such as the flagship Apple Store in San Francisco) even host concerts and other creative events at the lush and eye-catching downtown location. Part of Ahrendts' legacy at Apple is in "re-crafting the experience to provide more connection, more classes and experiences, and also in adding things to the internal decor to give it a sense of a life -- greenery, things of that nature," Lipsman said. Taking over for Ahrendts will be Deirdre O'Brien, Apple's current Vice President of People and a respected company veteran of three decades. Placing a respected vet at the helm of its powerful retail division is encouraging, wrote Wedbush's Dan Ives in a note this week. He added that Apple's retail presence in China -- and its ability to lure customers into stores -- could play a role in counteracting sluggish China sales. "A major focus of Apple with O'Brien now running the show will be catalyzing demand in China with the store experience a major factor in this region as well as other regions with consumers getting the 'Apple experience' when they look to test drive new technology in the store, a key ingredient in Cupertino's recipe for success," Ives wrote. Apple also has yet to launch a retail presence in India, owing to local protectionist laws and and economic factors that make selling high-end phones in the country difficult. As it awaits permission to establish official Apple stores in India -- a process that could prove lengthy -- Apple plans to grow its network of "premium" franchise outlets in key locations to build up its small retail presence there. What else could be next for Apple retail? As the company doubles down on services -- which includes software-based products like the App Store, Apple Music, iCloud as well as Apple Care -- one clue might reside in online reviews of Apple's popular San Francisco flagship, which gets 3.5 stars out of a possible 5, based on more than 1,200 reviews. True to Apple's brand, the store is a sleek, green and visually appealing space that's always crowded and buzzing with activity, including weekly live concerts and other events. But a quick search of Yelp (YELP - Get Report) also turns up numerous complaints of a chaotic check-in process and long wait times for service -- a sign that Apple's retail division has perhaps become a victim of its own success. "Two times in one week I've spent over 5 hours total of my life at this Apple Store. Wasted because of a lack of preparation, consideration for customers who invest a lot of money in their products," complains one Yelp reviewer. And diminishing service quality in stores could have been one factor that led Apple to conclude it was time for a change, wrote TheStreet tech columnist Eric Jhonsa on Real Money this week. Apple's stock was down 0.8% on Thursday and is up 8.4% so far this year after reporting a December quarter that slightly beat lowered guidance it issued in early January.